Approximately 35 venomous snake species inhabit the land and seas surrounding southern China. These species represent a variety of evolutionary clades: keelbacks, kraits, cobras, sea snakes, sea kraits, coral snakes, vipers and pit vipers. Two frog-eating keelback snakes -- tiger (Rhabdophis tigrinum) and red-necked keelbacks (R. subminiatus) -- inhabit southern China. Though the fangs of these snakes are in the rear of the mouth, they're capable of delivering fatal bites. 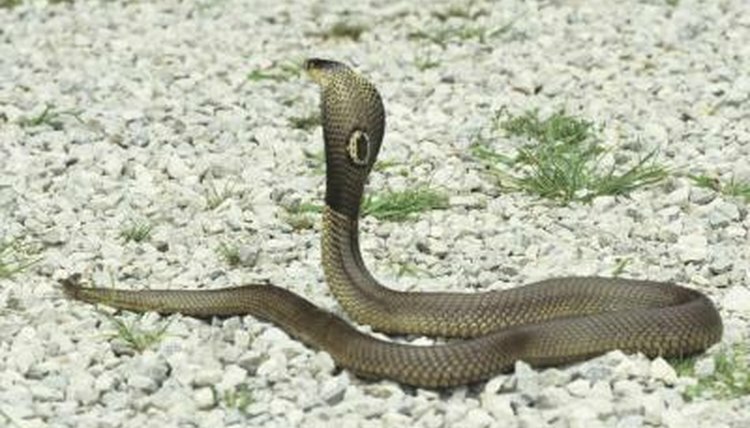 Three cobra species inhabit South China: the Chinese cobra (Naja atra), monocoled cobra (Naja kouthia) and king cobra (Ophiophagus hannah). The Chinese and monocle cobras average 3 to 5 feet in length and look very similar; positive identification often requires examination of the scales by an expert. Both species consume frogs, lizards, rodents and snakes. King cobras are the largest venomous snakes in the world. Preferring forested areas with incomplete canopy cover, king cobras consume lizards, but primarily hunt snakes. The kraits native to South China are nocturnal hunters. The banded krait (Bungarus fasciatus) is one of the largest krait species and can reach 7 feet in length; the smaller many-banded krait (Bungarus multicinctus) averages 5 feet. Krait venom is one of the strongest snake venoms. Both Kellog’s (Sinomicrurus kelloggi) and MacClelland’s coral snakes (S. macclellandi) range throughout southern China. Though these coral snakes are small, with small fangs and a shy nature, they're very dangerous and have caused human fatalities within eight hours of a bite. Five types of sea snake and two amphibious sea kraits live along China’s southern shores. The spiny-headed (Acalyptophis peronii), olive (Aipysurus sp. ), Stoke’s (Astrotia) and Shaw’s sea snake (Lapemis curtus) live entirely in the ocean. Sea kraits are not completely aquatic, coming onto land to deposit their eggs; both the yellow-lipped (Laticauda colubrine) and black-lipped (Laticauda laticauda) inhabit China’s southeastern shores. While most sea snakes and sea kraits have incredibly toxic venom and fangs capable of effective delivery, the turtle-headed sea snakes (Emydocephalus sp.) have very reduced fangs and relatively weak venom because they eat only fish eggs. Two true vipers inhabit southern China: Fea’s viper (Azemiops feae) and the infamous Russell’s viper (Daboia russelli). Fea’s viper is a secretive, shy and poorly known species; by contrast, the Russell’s viper is irascible and responsible for a number of bites each year. Scientists have not collected enough data to determine the wild diet of Fea’s viper, but many researchers suspect that subterranean rodents are their principle prey. The Russell’s viper eats large rodents and occasionally birds. The majority of the venomous snakes living in southern China are pit vipers, and most of the pit vipers are of the genus Trimeresurus. The white-lipped pit viper (T. albolabris), Mangshan pit viper (T. mangshanensis), Motuo pit viper (T. medoensis), Tibetan bamboo pit viper (T. tibetanus), Kham Plateau pit viper (T. xiangchengensis), Grumprecht’s green pit viper (T. grumprechti), Taiwan mountain pit viper (T. gracilis) and Yunnan bamboo pit viper (T. yunnanensis) share similar biology but inhabit slightly different niches. Snorkel-nosed vipers (Deinagkistrodon acutus) resemble copperheads (Agkistrodon contortrix) from the New World. The range of both the Mamushi (Gloydius blomhoffii) and Likian pit viper (G. monticola) includes China, though they are not common in southern China. Scientists working in the region are still discovering new species; in summer 2011 scientists formally described the ruby-eyed pit viper (Protobothrops maolanensis), which lives in China along with the closely related Jerdon’s (P. jerdonii) and brown-spotted pit vipers (P. mucrosquamatus). The beautiful green Stejneger’s bamboo pit viper (Viridovipera stejnegeri) hunts rodents, birds and frogs in the trees. Three small, terrestrial species, the mountain (Ovophis monticola), graceful (O. gracilis) and Zayu pit viper (O. zayuensis), also inhabit South China. Vapa Guide: Venomous and Poisonous Animals Biology & Clinical Management: Rhabdophis Ssp. Vapa Guide: Venomous and Poisonous Animals Biology & Clinical Management: Trimeresurus Ssp.